I love freshly baked, homemade cinnamon rolls. Particularly for breakfast, in the actual a.m. What I don’t like so much is getting up early enough to make cinnamon rolls from scratch. But guess what – I can make those cinnamon rolls in advance and bake them fresh, without waking up incredibly early! This means that cinnamon rolls are ready for me on Christmas morning, or any morning that deserves an extra special breakfast. And not just how to bake cinnamon rolls after freezing them – how to make ahead loaves of bread, scones and biscuits, croissants, and pancakes from the freezer as well. All pictures below, except for the croissant, are items that I have frozen, then baked. Impatient? Here’s this post’s table of contents. How Long Do I Need to Freeze Bread Dough Before I Wrap It? How Long Does Frozen Bread Dough Last? Why Prepare Bread Dough in Advance? 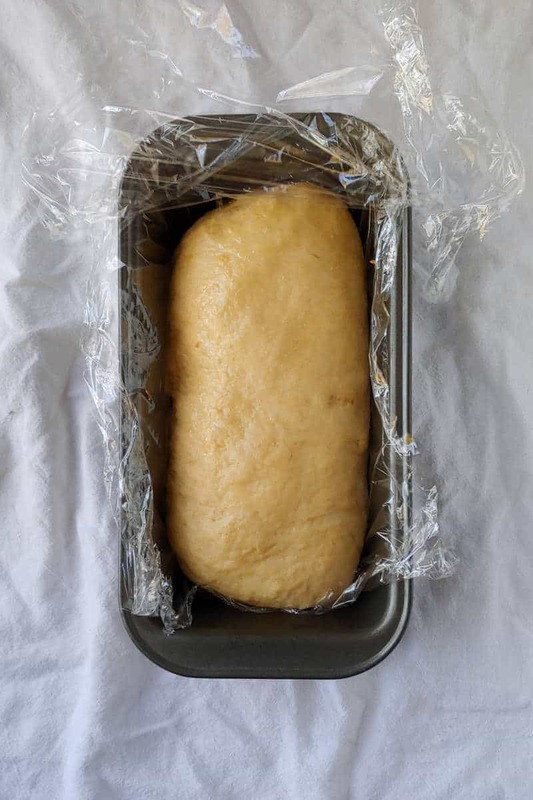 Refrigerating bread dough to let it rise is, in general, a great way to enhance flavor in your bread. Peter Reinhart, author of The Bread Baker’s Apprentice (affiliate link) (and who I reference a lot), is an advocate of that, as are many other bakers. So that’s a step in almost any bread on this website that references Reinhart, including Easy French Bread and Italian Bread. But beyond that, sometimes you just don’t have time to do all that work all at once. Cinnamon roll recipes, for instance, take 2+ hours to prepare, even before you get to bake them. If it’s a holiday like Thanksgiving or Christmas, you don’t have time for that! You have lots of other things to be make the day(s) before. Another benefit – freezing portions of bread dough when you make a recipe that makes a lot. In general, you have two options for preparing your bread dough in advance. 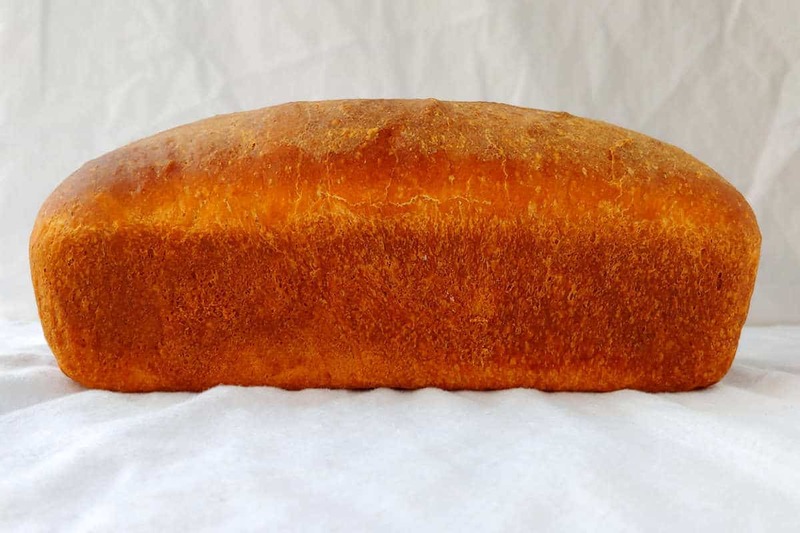 Make and shape your bread the day, then refrigerate it overnight to let it rise, and bake it the next day. Make and shape and let your bread rise, then freeze it before baking it. The first time I refrigerated dough overnight was when I made Alton Brown’s Overnight Cinnamon Rolls. That overnight rise was built in! I’ve made cinnamon rolls with an overnight rise ever since, regardless of whether or not it calls for it. You make the rolls the day before, stick them in the fridge to let them rise, and bring them to room temperature the next day. However, sometimes you don’t have time or inclination for that on Thanksgiving Eve or Christmas Eve. Plus, cinnamon roll recipes often yield 18 or so rolls. You can’t eat that much bread at once! 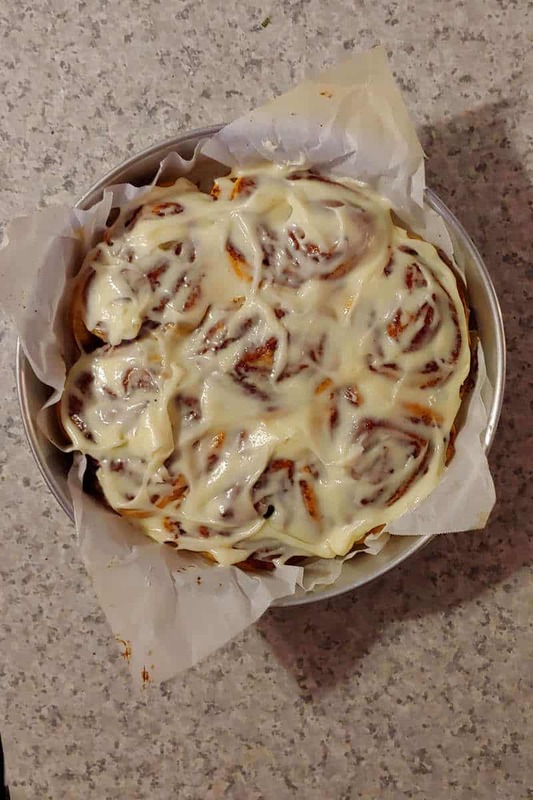 Mostly recently, I’ve been making this recipe for Cinnamon Rolls with Cream Cheese Glaze, but it yields 18. We only have 3 people in my house. We cannot eat 18 cinnamon rolls in one go. We can, however, polish off 9 over 2 days, and freeze the other 9 to bake another day. So what you do is make the dough, shape it, let it rise, and instead of baking it, stick it in the freezer. 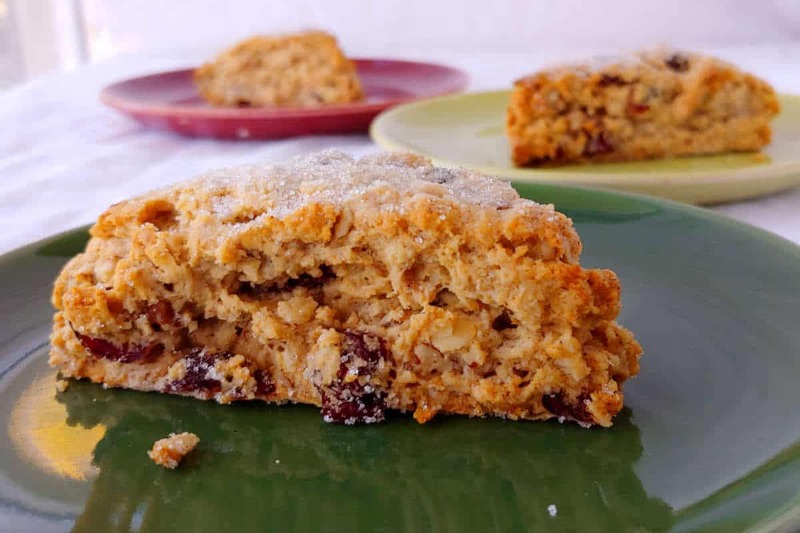 You pull it out the day before you want to bake it, let it rise overnight in the fridge, and bake it the next morning, adding just a few minutes of time to the baking time. Yes, you can have freshly baked, homemade cinnamon rolls for breakfast, with next to no work from you that morning! Make dough and let it rise as usual. Roll out the dough, put on the cinnamon filling, roll it up, cut it into rolls, and put it in your pan. Either use a disposable pan that you won’t need while the cinnamon rolls are in the freezer, or line your pan with parchment paper. 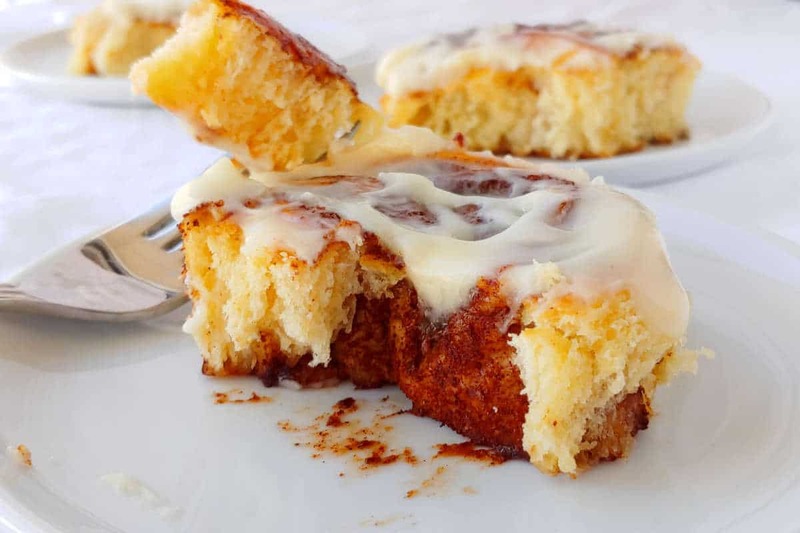 Let the cinnamon rolls rise until the point right when you would bake them (45 minutes to double them, for this recipe). Take the pan and stick it in the freezer. Once the cinnamon rolls are frozen, cover your pan with plastic wrap. If you’ve used parchment paper, use it as a sling to remove the rolls from the baking pan; place the frozen rolls, with their parchment, in a gallon sized freezer bag. If it doesn’t fit, wrap it in 2-3 layers of plastic wrap. Use tape to secure the plastic wrap if necessary. Wrap in a layer of foil for longer storage. I baked mine after a month; they were delicious. I haven’t tried keeping any longer than that. The afternoon before you want fresh cinnamon rolls, pull the frozen dough from the freezer. Place the parchment paper and rolls back into the pan you’ll bake them in, and loosely cover. If they’re in a baking pan already, loosen the plastic wrap so that it’s not against the rolls; it will stick otherwise. Let the dough thaw in the refrigerator overnight. The next morning, let the rolls rest at room temperature while the oven preheats. Bake at the normal baking temperature; you may need to add an extra 5-10 minutes. The edges and tops should turn golden, but be careful not to overbake. Frost as usual. Speaking of frosting, you can make it ahead of time and freeze it too! 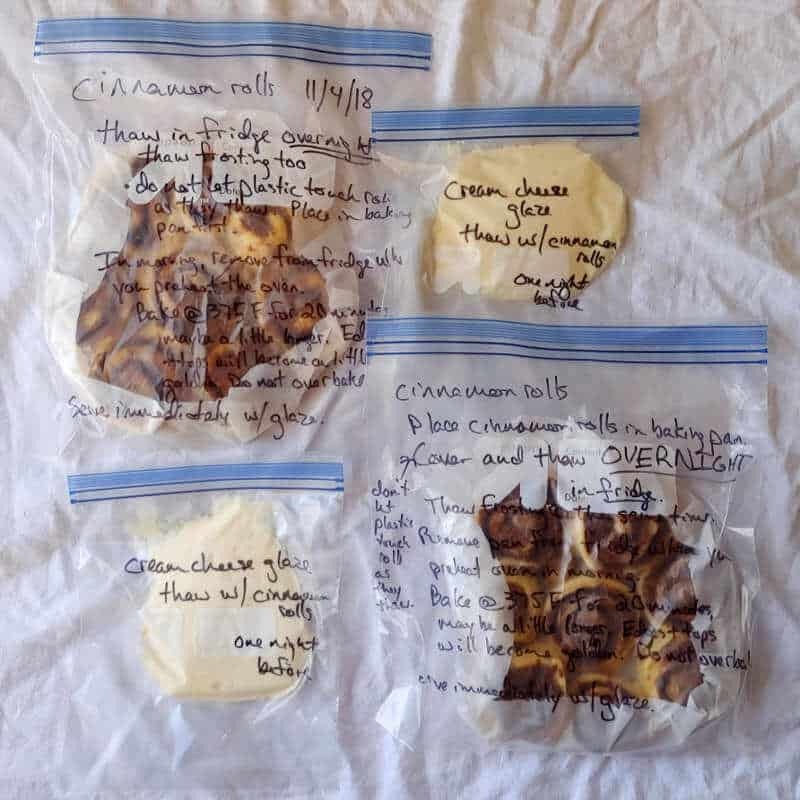 I prefer to make the frosting the day I bake the cinnamon rolls, but if you know you’ll be short on time, or you’re only freezing half of your dough because you’ve baked the other rolls already, you can stick the frosting in a separate freezer bag. 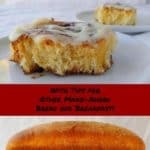 Pull it out to thaw in the refrigerator along with the cinnamon rolls. 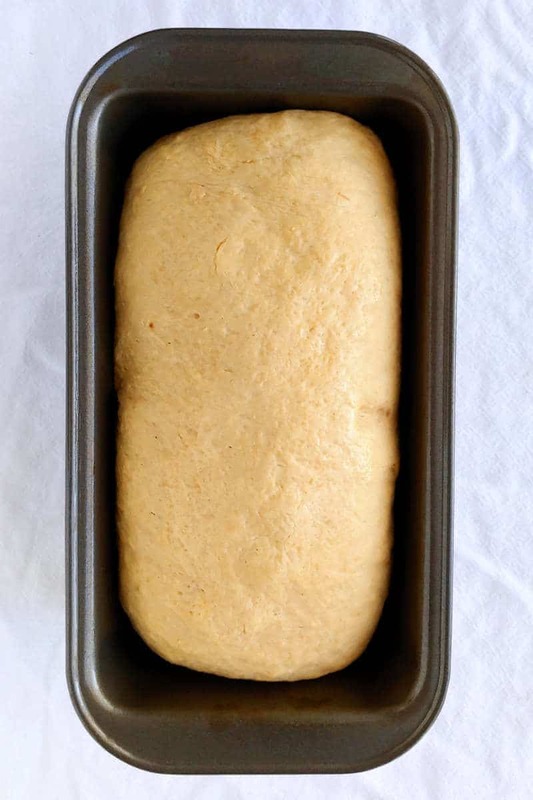 For larger loaves, like Yeasted Banana Sandwich Bread, make the dough, let it rise, and shape it as usual. Grease the loaf pan and place the dough in the pan. Or, line the loaf pan with parchment or plastic wrap before putting it in the pan (unless you want your pan out of commission for a while). Cover with greased plastic wrap, and freeze for about 10 hours, or overnight. Remove frozen dough from the pan. Wrap the frozen dough in a couple of layers of plastic wrap and a layer of foil. Label and store in the freezer. As with the cinnamon rolls, you’ll probably want to bake this within a month. Pull the frozen dough from the freezer the day before you want to bake it. Unwrap it, place it in a well-greased pan, lightly cover it (don’t let the plastic wrap touch the dough), and thaw in the refrigerator overnight. The next day, you will still need to let the dough have its second rise. It will have risen a little already in the refrigerator, but likely not enough. (See above – the dough thawed overnight, but didn’t rise much.) This second rise may take longer than usual. The Yeasted Banana Sandwich Bread I made here needed to rise 1 inch above the top of the pan before I baked it; this rise that usually takes 45-60 minute instead took 2 hours (in a cold fall kitchen). Place the dough in a greased pan (if you haven’t already), let rise at room temperature, and bake as usual. 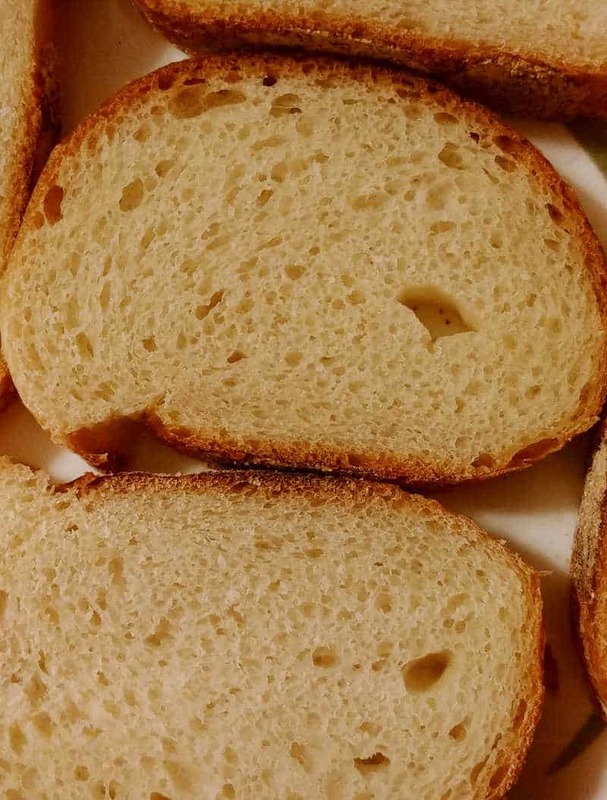 I’ve read that lean dough, like for French Bread, doesn’t last as long in the freezer as dough enriched with butter, eggs, and milk (like for sandwich bread above), so I wouldn’t try freezing lean dough more than a few weeks in advance. I haven’t tried freezing French or Italian Bread dough before, but I want to try. One recipe often makes 2-3 loaves, so I usually slice it, wrap 3-5 slices in plastic wrap, and store it in freezer bags. I often turn it into garlic bread after thawing. To freeze and thaw, use the same method as for the enriched/sandwich bread above, but without using a loaf pan. I’ve only made croissants the one time because it is a time-intensive process. But the results were infinitely worth it. 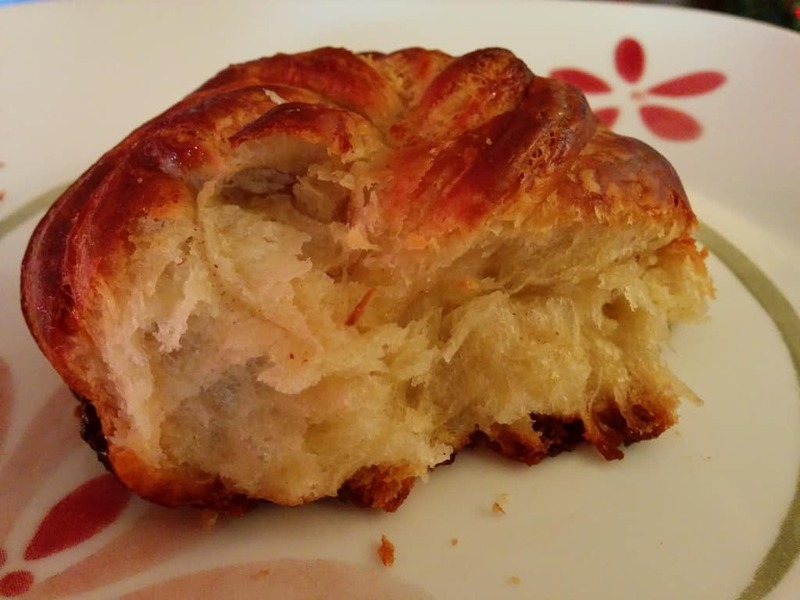 The recipe yielded about 24 croissants – way more than anyone should eat at once! So I froze many of them unbaked. Freezing them was a fantastic idea. I highly encourage it. 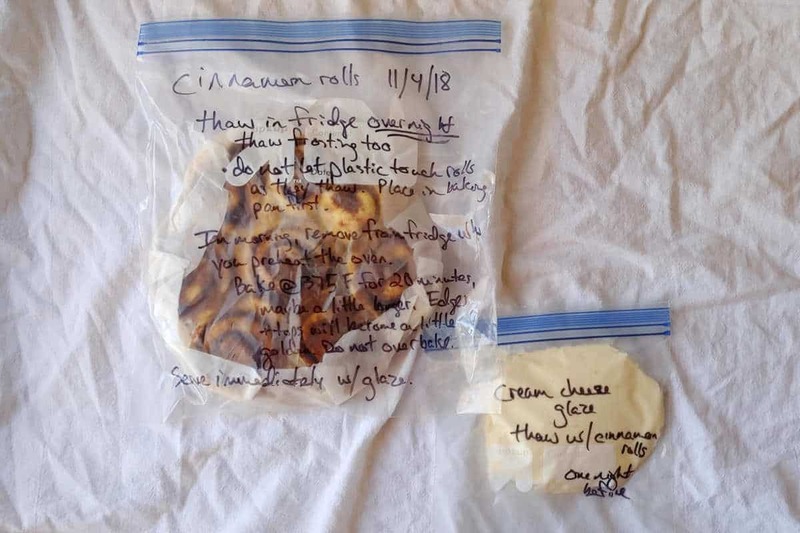 I’ve read that you can thaw them in the refrigerator overnight, just as you do for the cinnamon rolls above; however, I have never done that. Instead, I have baked them directly from the freezer, adding a few minutes on to the baking time, as we do with the scones and biscuits (see section below). Yes, croissants are a lot of work to make. I made them when I was 7 months pregnant. It made me tired. Frozen croissants in the grocery store are expensive! And bakery ones cost even more! I’ve had other good freezer croissants, and they honestly weren’t nearly so good as mine. Homemade croissants are customizable! Make them with chocolate or cinnamon sugar. If you’ve got a little time in advance and want to impress guests (or yourself, on Christmas morning), try making yourself homemade croissants to bake from the freezer. I’ve been freezing scones for years. It’s incredibly easy. It used to be that I would make and bake the entire batch of scones, and then freeze the baked leftovers. They tasted fine that way. But the better way to do it is to make the batch, bake only what you’ll eat that day, and freeze the rest unbaked. 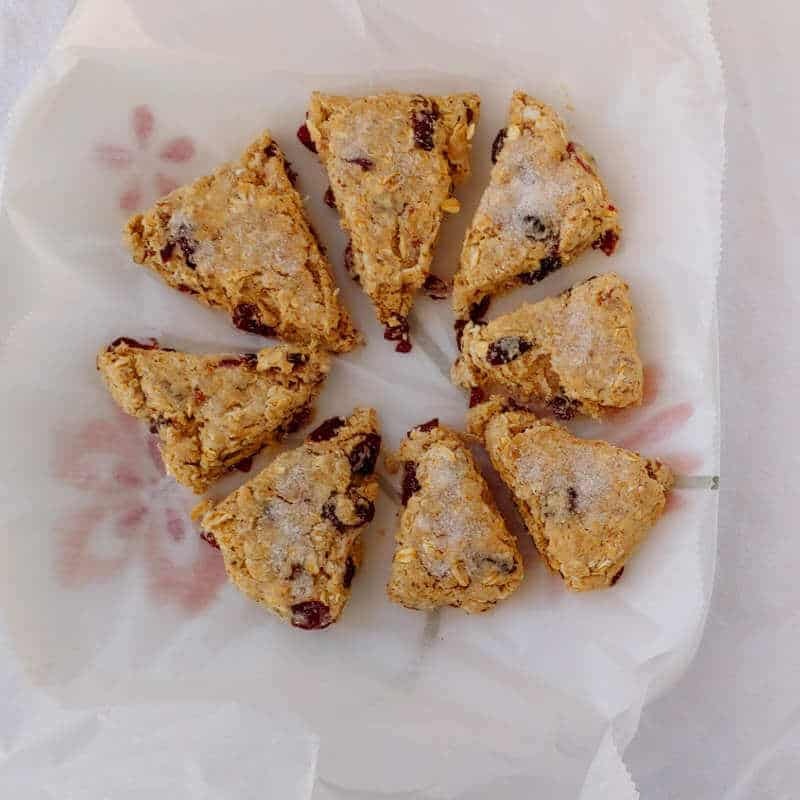 That’s what I did recently with these Cranberry Oat Pecan Scones. Make the scones and shape them. Bake however many you’d like to eat that day (if any, but why wouldn’t you?). 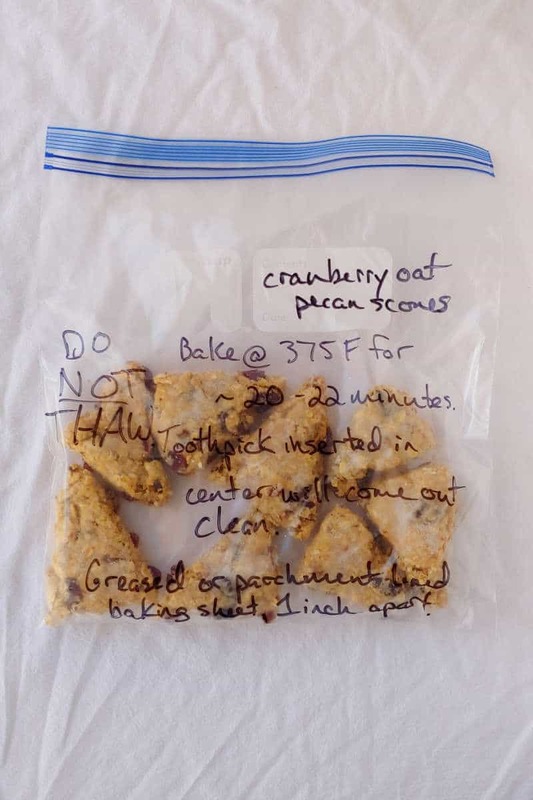 Place the remaining scones on a plate lined with waxed paper (my preference) or plastic wrap; scones will be hard to remove once frozen if you place them directly on the plate. Freeze until solid (as above), then remove from the waxed paper and place in a freezer bag. Squeeze as much air out as possible. Bake straight from the freezer – no thawing required. Add 2-3 minutes to your baking time (although this depends in part on the size of your scones). If topping with sugar or other toppings, do you top them before freezing, or after? If using sanding sugar or chocolate chips, go ahead and pat them on before freezing. Any kind of glaze will need to wait until after you’ve baked them. Baking powder biscuits work the same way – shape and freeze, then bake from frozen. No, pancakes and waffles aren’t quite baked goods. But they fit into this section because like everything else listed here, they are often in bread sections of cookbooks, and they are for breakfast!! Pancakes can be made ahead and reheated as well. If I have extra pancake batter, I go ahead and cook it, rather than trying to save the batter to cook another day. To make pancakes ahead of time, cook them as usual. Cool them, and then you can refrigerate them or freeze them. To refrigerate, just place in a sealed container. 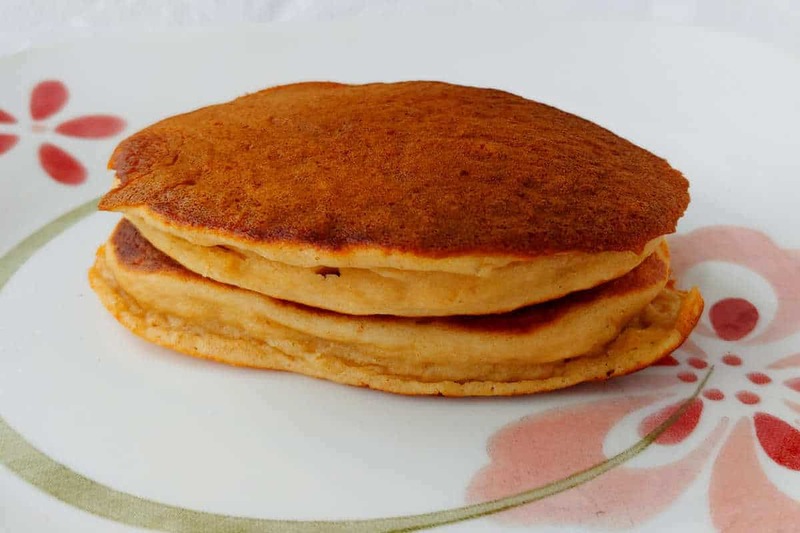 I often freeze my leftover pancakes in bunches of 2 (perfect lunch size for a 3 year old). I separate pancakes with a layer of waxed paper, then wrap the bunch in plastic wrap. I turn it over and wrap it again with plastic wrap, then place it in a freezer bag. You can also place pancakes side by side on a baking sheet and freeze them, then store them in a freezer bag. This method works well with leftover waffles too. 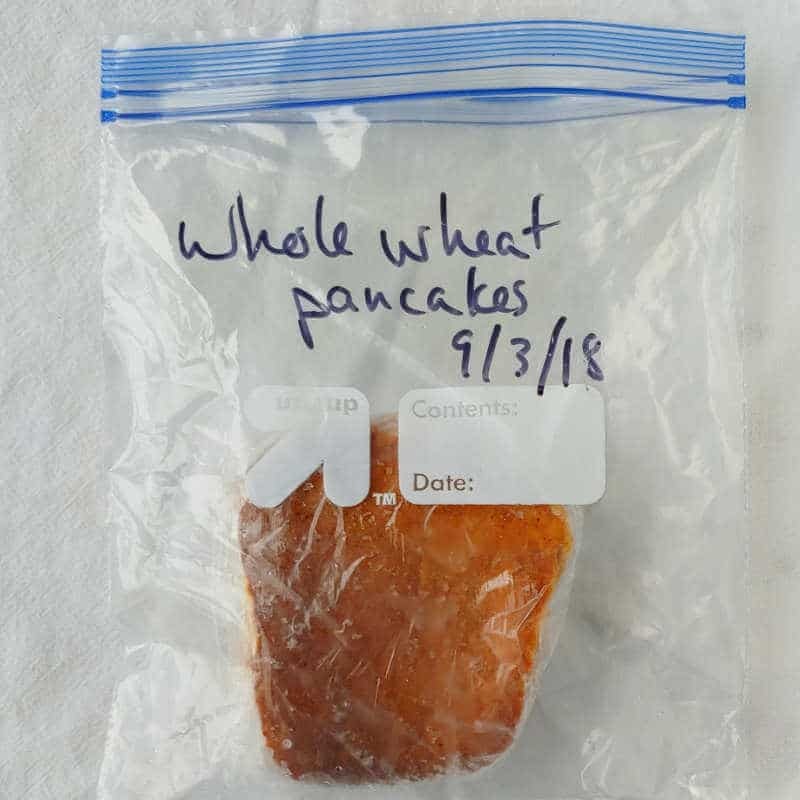 Place in a freezer bag once pancakes/waffles are frozen. To heat just a few pancakes, remove and unwrap the pancakes. Place pancakes side by side on a plate, and microwave for about 30 seconds (depending on the strength of your microwave). You may need a little more or a little less time, but be careful – if you overheat the pancakes, they will become rock hard. Just like that, you have an easy hot breakfast with no morning preparation on your part! You can also cook bacon or sausage ahead of time, refrigerate it, and reheat it gently to go along with your pancakes. How Long Do I Need to Freeze Dough Before Wrapping It? I honestly don’t know the minimum amount of time needed to freeze dough before you stick it in a storage bag. I often forget to store my frozen food until the next day. My refrigerator and freezer are relatively odor-free, so I never worry about my food picking up off smells. And my food usually does not get freezer burnt. I trust my freezer, so an overnight freeze is safe for me. 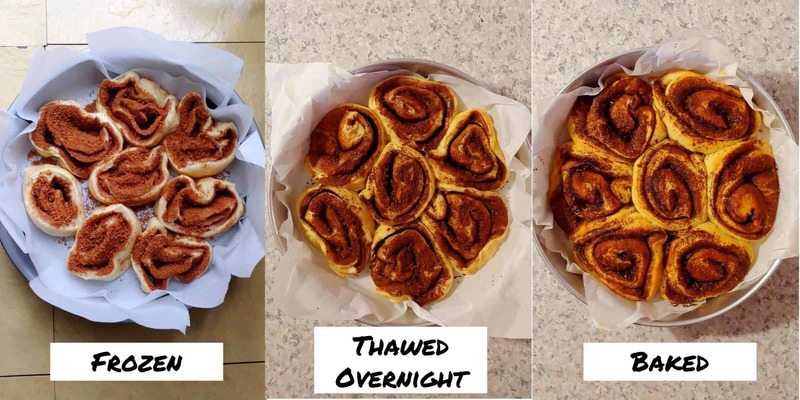 Thinner items will freeze faster than bulkier things (cinnamon rolls, items in baking pans). So, 30 minutes for things like pancakes or waffles side by side; longer for other items. How Long Will Frozen Bread Dough Last? I’ve seen a range of guesses on how long frozen dough will last in the freezer before you bake it, anything from 1-3 months. I think it depends, in part, on your freezer. My freezer has been pretty reliable (knock on wood as I type this). I’ve certainly baked cookie dough that’s been in there for months and they’ve still been good cookies. Items containing yeast may not last as long as items made with baking powder or baking soda. How long your bread dough will last also depends on how you store it. Be sure to wrap your dough well and squeeze the air out of the freezer bags. Also, keep your dough in the main part of the freezer, not in the door where it’s exposed to the outside air and variations in temperature. Always write down the recipe, the baking temperature and time, and whatever you may need to do after you bake it. Write frosting ingredients on the freezer bag if you’ll need them. King Arthur Flour had a handy guide about 10 years ago on how to make and freeze dough so that you can have fresh-baked items when you want them. I’ve done this a few times, and I really like the results!